A meeting of the County Board took place this evening. 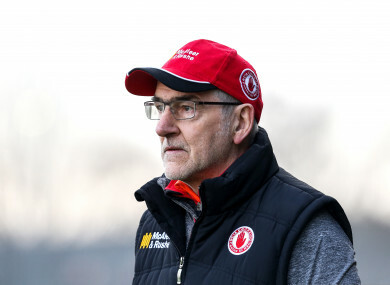 MICKEY HARTE WILL remain on as Tyrone manager for another three years. At a meeting of the County Board this evening, it was decided that Harte would continue in the role. Reports suggested the veteran coach – who has been in charge of the Red Hands for 15 years – was seeking another two-year term at least. Fifty-two delegates and 16 Tyrone management committee members were expected to cast votes. Harte has managed Tyrone to three All-Ireland titles and although their was another Ulster championship success earlier this summer, it was followed by a disappointing performance against Dublin in the All-Ireland semi-final, a game Tyrone lost by more than double scores. After that result, there had been some talk that a change was needed in Tyrone but Harte remains for now and a new era will have to wait a little longer. Now his Tyrone days are over, what can we expect from Sean Cavanagh the pundit? Email “Mickey Harte to stay on as Tyrone manager for another three years”. Feedback on “Mickey Harte to stay on as Tyrone manager for another three years”.